Edith Keturah Hinshaw1,2 [Edith Katura Hinshaw3,4]. Retter, Arnold W., head-of-household, age 23, born in Indiana; father born in Germany; mother born in Indiana; first marriage, married 4 years; occupation: farmer, stock farmer; rented farm. Retter, Edith K., wife, age 22, born in Indiana; father born in North Carolina; mother born in Indiana; first marriage, married 4 years; 2 children, 1 living. Retter, Maud E., daughter, age 3, born in Indiana; parents born in Indiana. 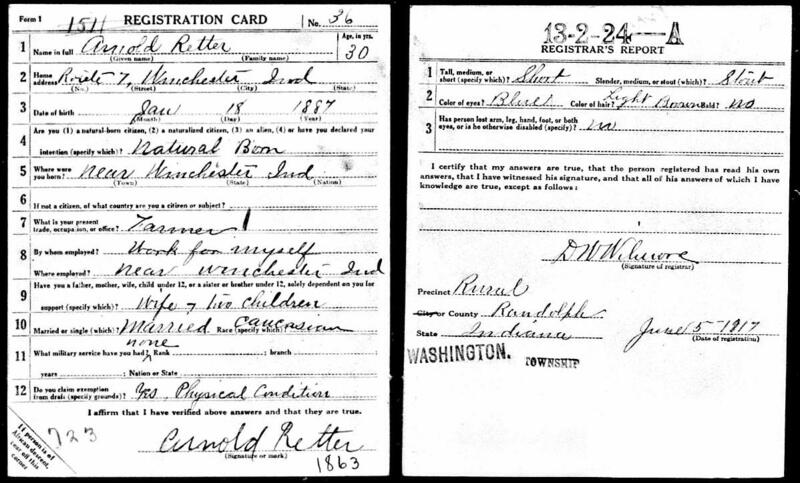 Retter, Arnold, head-of-household, age 31, born in Indiana; father born in Germany; mother born in Indiana; rented farm; occupation: farmer, general farm. 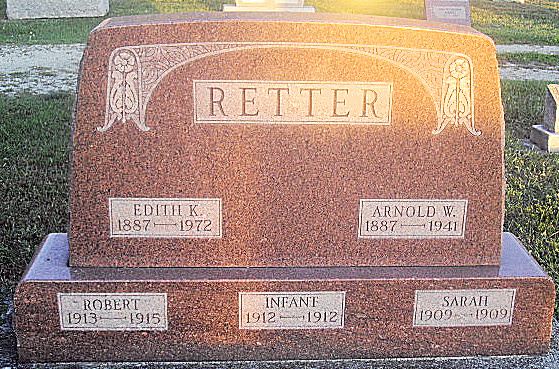 Retter, Edith K., wife, age 31, born in Indiana; father born in "Ohio? "; mother born in "Indiana?". Retter, Maude E., daughter, age 13, born in Indiana; parents born in Indiana. Retter, Harold W., son, age 9, born in Indiana; parents born in Indiana. Edwards, Russel R., ward, age 13, born in Indiana; parents born in Indiana. Bradbury, Orville, help[er], age 19, born in Indiana; parents born in Indiana; occupation: laborer, on farm. Retter, Arnold, head-of-household, age 43, born in Indiana; father born in Germany; mother born in Indiana; first married at age 19; rented farm; radio in home; occupation: farmer, farming; not a war veteran. Retter, Edith K., wife, age 42, born in Indiana; father born in Ohio; mother born in Indiana; first married at age 18. Retter, Hearold W., son, age 19, born in Indiana; parents born in Indiana. Hinty, Harry, boarder, age 28, born in Indiana; parents born in United States; single; occupation: farmer, farming; not a war veteran. Retter, Arnold, head-of-household, age 53, born in Indiana; completed 8th grade; on Apr 1 1935 was living in the same house; owned farm ($800 value); occupation: farmer, farm. Retter, Edith, wife, age 52, born in Indiana; completed 8th grade; on Apr 1 1935 was living in the same house. Retter, William, brother, age 58, born in Indiana; completed 8th grade; on Apr 1 1935 was living in the same house; single; occupation: farmer, farm. Contribution from granddaughter Nina Rittenhouse (). Ancestry Family Tree data "RITTENHOUSE FAMILY TREE" posted by "GregRittenhouse". 1900 census, Washington Township, Randolph County, Indiana; roll T623-399, ED 129, page 13B, line #85, dwelling #319, family #321. 1910 census, Washington Township, Randolph County, Indiana; roll T624-376, ED 142, page 6B, line #98, dwelling #138, family #138. 1930 census, Washington Township, Randolph County, Indiana; roll T626-624, ED 17, page 5B, line #58, dwelling #128, family #128. 1940 census, Washington Township, Randolph County, Indiana; roll T627-1089, ED 68-17, page 2B, line #62, household #37. Indiana, Index to Select Marriages, 1780-1992; http://www.ancestry.com. 1920 census, Washington Township, Randolph County, Indiana; roll T625-464, ED 160, page 7A, line #26, dwelling #158, family #158. Ancestry Family Tree data "PRICE FAMILY TREE" posted by "pricespencert". (Schwarzkopf) Frazier and Elizabeth (Swank) Frazier, Speedway, IN, 1982, pp 78-79.